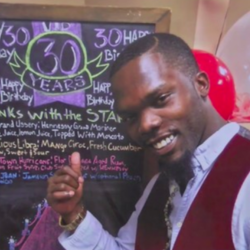 Bradley Blackshire, 30, of Little Rock was killed by Patrol Officer Charles Starks after a car driven by Blackshire struck Starks about 11 a.m. at Twelfth and Rodney Parham. A police release said Starks "located a 2018 black Nissan Altima, in a parking lot on 12th Street and Rodney Parham Road. The vehicle was listed as a stolen vehicle, according to police records. Officer Starks performed a traffic stop on the vehicle." The release said Blackshire refused Starks' order to get out of the car and began driving forward. Starks fired, apparently multiple times, and hit Blackshire. The vehicle stopped. The release said officers gave aid, but Blackshire died at the scene. Police learned later that a vehicle driving past on 12th was hit by a stray bullet. Starks was struck by the car, police said. He received treatment at a hospital, but the release didn't detail the extent of his injuries. The report lists a 20-year-old woman, Desaray Clarke, as a passenger in the vehicle, but no mention of any injuries to her. She was questioned and released. The incident report reveals few details. There's no description of where Starks stood and where the vehicle was stopped when the encounter began. It says the Nissan was owned by Carco Carriage Co. of Fort Smith. It was the only item listed as impounded. There's no mention of a gun being found on Blackshire or in his car.